Late this winter, the Jefferson City-based Missouri Economic Research and Information Center, a state government agency, published its annual comparative cost-of-living indices for 2018. For years, MERIC has regularly updated its indices to estimate the current cost of living for each state. The National Institute for Labor Relations Research uses these data to calculate average annual costs of living for Right to Work states as a group and forced-unionism states as a group. As of the beginning of last year, 27 states had already adopted and implemented Right to Work laws protecting employees from federal labor law provisions authorizing forced union dues and fees. The 27 Right to Work states combined had a population-weighted cost of living 6.1% below the national average in 2018. The 23 forced-unionism states combined had a population-weighted cost of living 19.7% above the national average. On average, forced-unionism states were 27.6% more expensive to live in than Right to Work states last year. 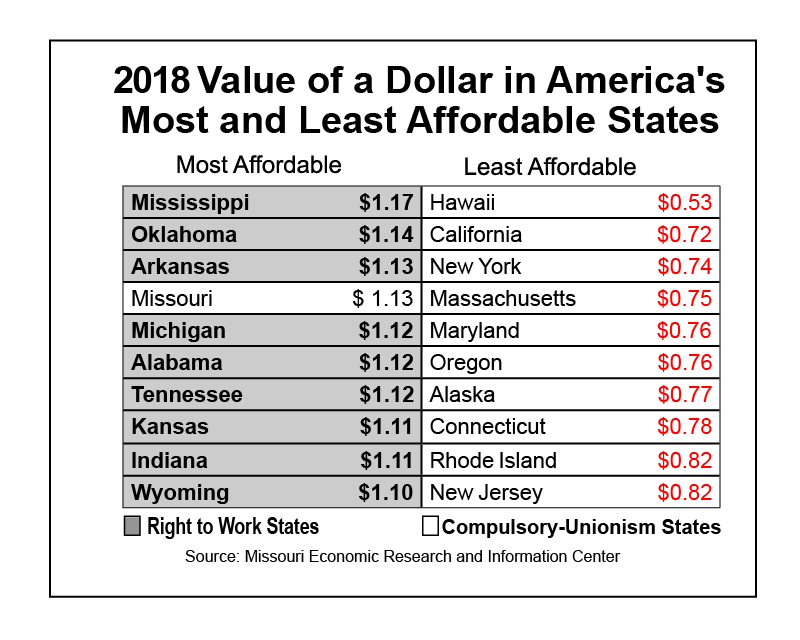 Not one of the 14 highest-cost states in 2018 has a Right to Work law. But 13 of the 14 lowest cost-of-living states protect employees’ Right to Work. And many economists credibly argue that excessive government regulation is a major factor behind high housing, energy, and other costs in forced-unionism states like California, New York, New Jersey, Connecticut and Massachusetts. Moreover, decades of academic research by economists such as Thomas M. Carroll and Richard J. Cebula have shown that one side benefit of state Right to Work laws is that they help reduce the cost of living in the jurisdictions where they are in effect. “Even in the highly unlikely event it could be established that forced unionism did not cause higher living costs, the strong correlation between forced unionism and higher costs would still be relevant in assessing the economic impact of Right to Work laws. “What matters most to employees seeking better lives for themselves and their families, and employers seeking to attract and retain good employees, is not nominal wages and salaries. “It is what those wages and salaries can buy in the location where the employees and their families live. “That’s why honest efforts to make comparisons of annual wages and salaries and other types of income in Right to Work states versus forced-unionism states must always be informed by MERIC’s or some other nonpartisan comparative cost-of-living index. “For example, in 2017 the real average annual compensation per private-sector employee in Right to Work states was roughly $1,750 higher than the average per employee compensation in forced-unionism states, using MERIC’s indices to adjust for regional cost-of-living disparities.